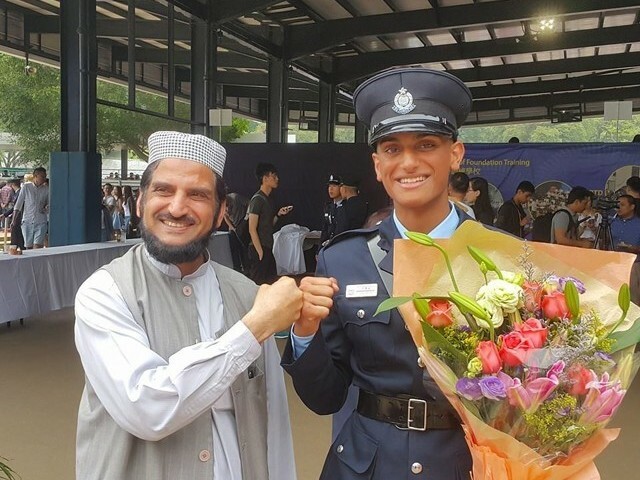 A Hong Kong policeman of Pakistani descent has become an overnight hero after he talked a man out of committing suicide. Ifzal Zaffar, 20, spoke fluent Urdu to the suicidal man, who was also Pakistani. The man had climbed up a crane at a construction site and police were called to the scene. Zaffar climbed up the 65ft crane and exchanged words with the man, after which he agreed to come down and was taken to a hospital. The 20-year-old joined the police force just under a year ago, and is the only Pakistani origin officer in the district. Zaffar’s commanding officer praised the way the 20-year-old handled the situation. The 20-year-old’s good looks have also been noted by media outlets, with him being branded “pretty boy cop” and “Hong Kong’s most handsome police officer”. On an interview video shared by the Hong Kong Police on Facebook, people praised the young man’s actions. “He is very handsome yet having a golden heart,” gushed Facebook user Nuna Priya. “Mr Ifzal Zaffar, many citizen support you, pls keep on serving the society. Thanks!! !” wrote Baba Bebe Wong. “Excellent Cantonese…good character…friendly personality…high spirit…he’s an [asset] to the Hong Kong police force,” Richard Chin wrote. This story originally appeared on BBC.